Thanks for your sharing! This should be paid attention. The inaction by the NRC on this spent fuel problem is inexcusable! Almost 2,000 years ago a Roman official washed his hands of the blood of an innocent man. In their own sick way today’s NRC is washing its hands of our innocent blood. Sorry for the messed up prior message. Let me try to clear up Half-TruthSlayer’s last post. Too bad the NRC still has to have some involvement at a nuclear site even with the reactor there long shutdown. As long as spent fuel is there the NRC must remain involved. At utility/taxpayer expense. There are now 26 reactors shutdown across the country. And the spent fuel sits there causing not only NRC involvement but the costly involvement of utility personnel to nurse-maid it, check it, and guard it from sabotage. What a “waste”, all because the NRC has not provided for a safe centralized storage location. Not having a safe centralized location for spent fuel puts us all at considerable risk, not only from radiological sabotage but from a Japanese-type nuclear disaster. The NRC is waiting for others to act on this problem while they sit back and watch these dangerous nuclear stockpiles grow all over the US. They are the ones that know the dangerous consequences from a spent fuel accident. The NRC should be cited for dereliction of duty with regard to their stated mission of protecting public health and safety! 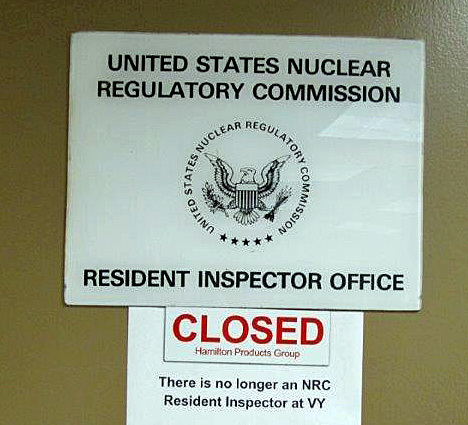 The NRC should also have Resident Decommissioning Inspectors since there will be RISKS that need to be monitored for decades and trusting Utility Operators of these decommissioned Reactors to do the job is simply “Poor Judgement” by the NRC, no matter what the Utilities say. Too bad the NRC still has to have some involvement at a nuclear site even with the reactor there long shutdown. As long as spent fuel is there yoy must remain involved. At utility/taxpayer expense. There are now 25 reactors shutdown across the country. And the spent fuel sits there causing not only NRC involvement but the costly involvement of utility personnel to guard it from sabotage. What a waste, all because the NRC has not provided for a safe centralized storage location.